Today’s measuring and control system in industry arena are increasingly sensitive, complex and thus more vulnerable to voltage surges. These sensitive devices and systems are critical to company’s communication and information processing. Therefore, it is necessary to ensure they can are protected from the potentially costly and disruptive events. Prosurge offer various quality SPD to protect sensitive equipment to increase their useful life and maintain the continuity of the flow of your information. PROSURGE DM../M4N… data network surge protection devices (SPDs) are designed for universal 1 or 2-pairs data lines against the damaging from surges and spikes caused by lightning and other electrical sources, suitable for use in category location B, C (ANSI/IEEE C62.41) or directly at the upstream near the protected devices. DM-../M..N7 data network surge protection device (SPD) is with failure indication and fault-current protection inside to make protection module replacement timely and prevent failure or even destruction of signal or communication system. These modules are suitable for digital I/O signal or analog power surge protection. Prosurge DM S2 Surge Protection Device (SPD) applied in protection for 2 single wires of balanced interfaces with measuring and control system, providing coarse and fine protection. They are suitable for use in category B, C (ANSI/IEEE C62.41) or directly at the upstream near the protected devices. 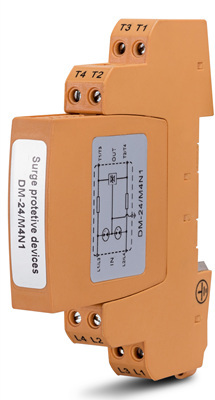 Prosurge DM S4 Surge Protection Device (SPD) provides protection for 4 single lines in the high-frequency bus systems or video transmissions, suitable for use in category B, C (ANSI/IEEE C62.41) or directly at the upstream near the protected devices.